Does anyone know where I can find a link or know how to make an item which, when crafted with, isn't destroyed but it uses durability. I've looked everywhere! Either they are out of date (older versions of mc) or they make no sense. The way to do this has not changed in forever. Show what you tried. This is the code. The problem is that (where underlined) is saying that field cannot be Resolved. It recommends using .getItem() but that crashes the game. I'm not sure what to use nor do?! This method is deprecated. Why are you using deprecated methods? This method does nothing. Why is it here? This method, once again, does nothing. What in the world?! What are you trying to achieve? Right I've changed my code. Do I need to override hasContainerItem() and getContainerItem()? Do I need to override hasContainerItem() and getContainerItem()? If you really mean the versions of these methods without parameters, then no. You need the ones that are not deprecated. 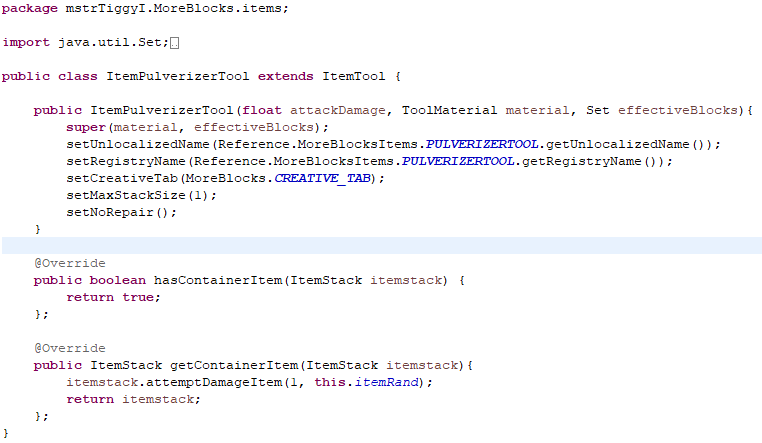 A pic of the class for the tool (no methods are deprecated). When the tool is used in crafting and product is made, the tool has a red zero next to it and disappears on click. I'm struggling to solve this one issue. You aren't using the methods without parameters so of course they're not deprecated. You must not modify the ItemStack that is passed to getContainerItem. If you want to return a modified version, you must copy it first. Hey thanks! I've managed to copy the item, although it's now indestructible, I now have something to work with. Now...how do I change the title to solve? Now...how do I change the title to solve?